Its time for the next Freebie and this time Dabur is giving Free Dabur Odonil Air Freshner Gel Sample. This is a contest where lucky winners will get the Free Sample. So Grab your chance to get the one. 2. Click on second image under “Latest Campaigns” on left side. 8. Fill in your shipping details like your Name, Phone No. Email Id. and Residential Address. 11. Like their Facebook Page to know about the winners. 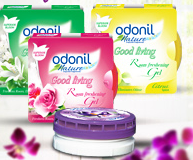 Odonil brings to you its newest offering – The Odonil Good Living Room Freshening Gel, a completely new product in the air fragrances category. The Odonil Room Freshening Gel possesses unique fragrant gelling agents with active ingredients, which gives all day long fragrance experience. The gel comes in an attractive and convenient packaging with a unique cap that allows you to control the flow of fragrance. Its attractive packaging and special design makes it suitable across different rooms. Be it your living room, bed room, dining room, or any other corner of your home. And it is available in attractive 4 unique fragrances – Lavender, Jasmine, Lemon and Rose.